Unique Paddlock design allows the option of interchangeable blades and shafts. Connections lock down tight with allen wrench tool. A 4-piece paddle that feels like a one piece paddle. Use our Lendal paddle builder to get exactly the paddle configuration you need. "Lendal touring paddles represent the culmination of everything we have learned in over 40 years of pushing the limits in paddle design and construction. Our company was founded out of a desire for better performance, and that desire for efficiency still drives everything we do. Our goal with these paddles is to make world-class performance available to everyone. We offer our performance-oriented designs in a wide range of constructions to suit a variety of requirements in strength, weight, and price." Stainless steel allen key tool used to operate the Lendal Paddlok Switchlok and Varilok systems. Note: when you order a complete Lendal paddle (both a shaft and blade set.) from Oak Orchard we include one Paddlok key. Add Drip rings to your 2-piece kayak paddle or replace your old drip rings. A great help in keeping water from running down your paddle shaft onto your wrists or lap as you paddle. Good for any 2pc. or 4pc. paddles. One pair of Drip rings. Note: when you order a complete Lendal touring paddle (both a shaft and blade set.) from Oak Orchard we include one pair of drip rings. Not included with whitewater paddles. T-grip handle attaches to a two- or four-piece Lendal Paddlok kayak paddle, converting it into an impromptu canoe paddle. Useful for paddling in overgrown creeks, mangrove swamps and under bridges and piers. Also valuable as quickly accessible spare paddle. This is a pair of Paddle Grips. Add our smooth grips to any two or four piece paddle with this kit. Compatible with straight or offset blades. These grips have no index and will provide a perfectly smooth surface for your hands. A good idea if you dislike the current texture of your paddle shaft. Use a hair dryer to shrink the grip tightly onto your paddle shaft, it's easy. note; You'll need a 2 or 4 piece paddle to use this kit (you can't slide the grips onto a one piece paddle). This is a 12" Grip Kit; includes one grip for right side and one for the left side of your paddle. Kinetik Touring takes the same Kinetik concept that revolutionised slalom paddling and offers it in a form specially adapted to touring. Kinetic energy is the energy of motion, and that is what this model is all about--it's exceptionally efficient, and produces a fantastic feeling of motion. This is a full-sized blade shape that is outstanding for high-performance paddling, cruising, training, and ocean play. Also popular for ocean and adventure racing, and the #1 choice of coaches. Material: Fiberglass/epoxy construction offers the stiffness and light weight of a composite lay-up without the price tag of carbon fibre. Thin edges are quiet in the water. FG composite is perfect for anyone who is most concerned with price-to-weight ratio, and for whom lighter weight is worth spending a bit extra. 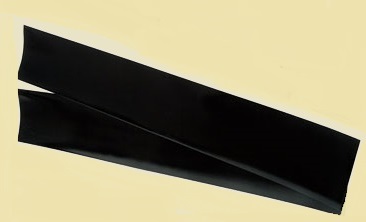 Blades sold in pairs; you would normally buy a shaft to make a complete paddle. The proven performance of Kinetik Touring, but in a smaller size for those who do not need so much power. Like its larger counterpart, it is also extremely efficient--though only mid-sized, you will travel farther for every stroke than you will with ordinary blades that are much larger. Kinetik shape provides greater power than its modest size would suggest. Cut-away throat allow for longer, more effective strokes A perfect choice for a smaller paddler who struggles to keep up. Kinetik Touring S was created for people who believe that high performance is for everyone, not just the "big boys". The proven performance of Kinetik Touring S is extremely efficient yet is also very smooth and quiet through the stroke. You will travel farther for every stroke than with ordinary blades. Kinetik shape provides greater power for precise manuevers on demand. The Kinetik Touring S blade design allows for longer, more effective strokes, a perfect choice for a paddler who wants to travel efficiently. Material: Lendal CF blades are reinforced with Carbon fibers. CF is the most rugged material available in its price/weight class. An excellent choice for a super tough touring paddle that delivers great performance. Blades sold in pairs; you would normally also buy a shaft to make a complete paddle. Kinetik Touring takes the same Kinetik concept that revolutionized slalom paddling and offers it in a form specially adapted to touring. Kinetic energy is the energy of motion, and that is what this model is all about--it's exceptionally efficient, and produces a fantastic feeling of motion. The Kinetik Tour blade provides plenty of power on demand. Choose 600 or 650 blade size for outstanding for high-performance paddling, cruising, training, and ocean play. Also popular for ocean and adventure racing, and the #1 choice of coaches. Material: Epoxy/carbon fiber construction is ultra-light, very stiff, and strong. It's the favorite choice of guides and instructors who must hold their paddles all day, and it is the obvious choice for any long journey where the light weight can prevent a lot of fatigue. The proven performance of Kinetik Touring blades are extremely efficient yet also very smooth and quiet through the stroke. You will travel farther for every stroke than with ordinary blades. Kinetik shape provides greater power for precise maneuvers on demand. The Kinetik Touring blade design allows for longer, more effective strokes, a perfect choice for a paddler who wants to travel efficiently. Blades sold in pairs; you would normally also buy (or already own) a shaft to make a complete paddle. Designed for the Lendal Paddlock system which allows you to swap out different blades and shafts to match any conditions. This shaft has the SwitchLok center joint which can be easilly adjusted from zero to ninety degree offset using the Paddlok wrench. There is also default setting at sixty degrees offset. Use the Paddlok wrench to tighten the center and blade joints so there is no wiggle typical of other brand multi-piece paddles. The Lendal Grade 1F Carbon sets the standard for performance touring shafts. Light in weight, it also has excellent breaking strength, and enough flex to help prevent joint problems, but not so much that it wastes stroke energy. This is the ultimate choice for the discerning paddler who cares about performance and comfort. This shaft has the SwitchLok center joint which can be easily adjusted from zero to ninety degree offset using the Paddlok wrench. There is also default setting at sixty degrees offset. Use the Paddlok wrench to tighten the center and blade joints so there is no wiggle typical of other brand multi-piece paddles. One-hundred percent fiberglass prepreg material in an epoxy matrix, for very favorable price/weight characteristics, along with good toughness. This shaft has the standard Paddlok center joint set at 45 degrees offset. Use the Paddlok wrench to tighten the center and blade joints so there is no wiggle typical of other brand multi-piece paddles. This shaft has the SwitchLok center joint which can be easilly adjusted from zero to ninety degree RH offset using the Paddlok wrench. There is also default setting at 45 degrees RH offset. Use the Paddlok wrench to tighten the center and blade joints so there is no wiggle typical of other brand multi-piece paddles. XPS is for eXtreme Performance Shaft, and that is where the demand for this came from. This Carbon shaft is made with a new wrapping process to produce a shaft that has incredible breaking strength (the highest we have tested) and a soft flex for comfort, which absorbs hard rock hits nicely. This is an incredible shaft for all kinds of paddling conditions. HPS is for High Performance Shaft, and that is where the demand for this came from. This Carbon shaft is made with a new wrapping process to produce a shaft that has great breaking strength, light weight and a soft flex for comfort, which absorbs hard rock hits nicely. This is an incredible shaft for all kinds of paddling conditions.